Well, it's a wrap. End of Volume 4. Finally, took me more than a month ... I don't think i'm going to do Volume 5 any time soon ... cos i can't find the translated one anywhere and the people in Yamibo doesn't seem keen in translating it cos it's too tough. Yes it's very tough. But if there IS a translated one around, I might take it on. XD. <- I don't own any of them. Not even a page. I still can't find V1 and V2 anywhere, if anyone got em, please send it to me, i wanna see~ Even though it's RAW, it's ok!!! Although i won't be able to understand either. Sigh, looking is enough. Oh for those who can't view the scans on my blog, I've uploaded the both translated V3 + Two Side Stories and V4 on Megaupload and You Send It [I really prefer YSI although it will expired after 7 days & 25 downloads but it's really stable, good speed and I can always reupload it, just tag me about it]. Check out the Manga Page, Doropanda Mai Hime Doujinshis section for the links. If you wanna host them, it's ok as long you tell me about it [I don't bite] and state the source =). 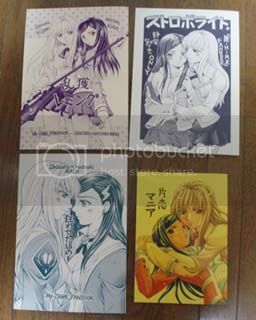 Do you know where you can buy these doujinshi? I love Shizuru's Solution for Natsuki! Lol!